Cherry trees of many types are grown in Ontario, predominantly in the southern part of the province where winter temperatures are milder. However, cold-tolerant varieties like the purpleleaf sand cherry are commonly found in the north. Most sour cherries are self-pollinating, whereas sweet cherries are usually cross-pollinators–meaning you need two trees for fruit production. Stella and tehranivee are two types of sweet cherry suitable for Ontario that self-pollinate if you only want one tree in the garden. Purchase a good quality 1-year-old tree from a local nursery or garden center. 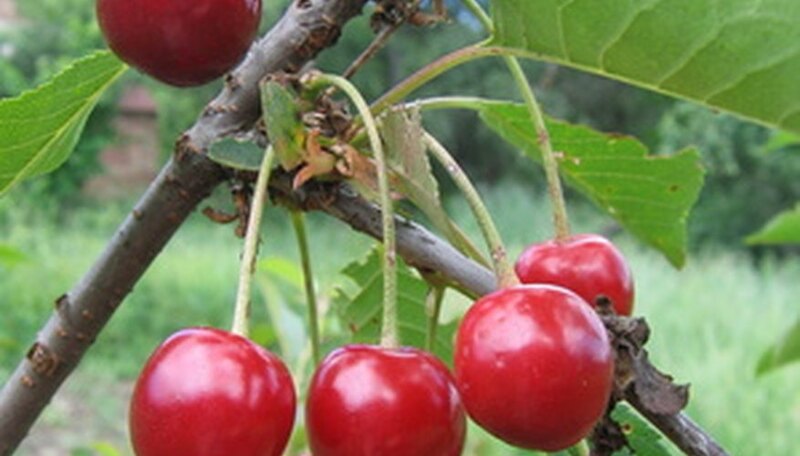 Sweet cherry varieties such as bing, stella and van are suitable for southern Ontario where winter temperatures usually stay above the minimum survival threshold of -10 degrees Fahrenheit. Cold-hardy sour cherry cultivars like northstar and montmorency are recommended for other regions of the province. Select a well-drained location that gets full sun. Cherry trees will not tolerate wet conditions, so avoid low spots with heavy soil. Test the soil at the planting site to check the pH level. Cherry trees grow best in slightly acidic soil with pH ranging from 6.2 to 6.8. The Ontario Ministry of Agriculture maintains a list of accredited soil testing laboratories in the province. Get advice from a horticulture professional on amending the pH level if it is well outside the desired range. Dig the planting hole at least twice as wide as the root ball and loosen the surrounding soil. Organics such as rotted manure or compost should be dug into the soil when planting. Make the hole deep enough so that the flare of the trunk is at least 1 inch above ground. Water thoroughly after planting and keep young trees well irrigated. Spread 6 inches of mulch around the tree using straw, wood chips, bark or sawdust. The mulch should be kept off the trunk and extend out to the drip line. Mulch is a very effective way to keep water close to the tree and suppress weeds. Prune the tree heavily after planting to encourage root development. Maintenance pruning is best done in spring to remove dead wood and thin out interior branches for better light penetration. Fertilize your cherry tree by adding mulch on a regular basis. Fruit bearing trees may also benefit from a balanced slow-release formula in the spring. Before buying your tree, find out the average size it will grow to when mature. Then consider whether your planting location provides enough room for the height and spread of the tree. Power lines, buildings and adjacent properties should all be considered when choosing locations for trees. In Ontario you are required by law to have underground services located before digging any holes. Contact Ontario One Call at 1-800-400-2255 at least five business days before you dig.